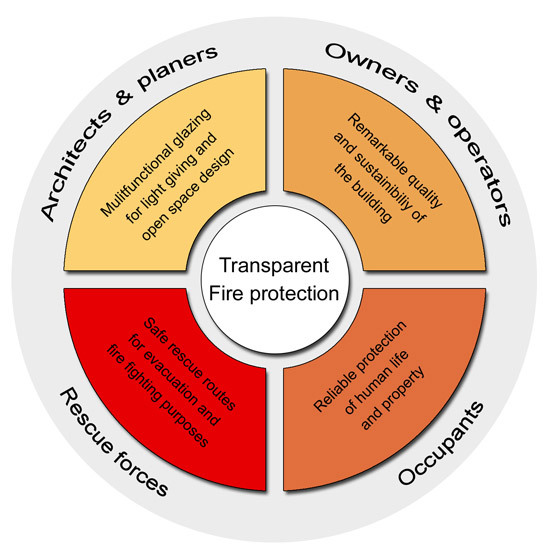 In modern architecture transparent fire protection is a core component of a holistic approach to implementing fire protection and safety concepts. Building, technical and organisational methods have to complement each other well to be best prepared in the event of a fire. Fire-resistant glazing serves primary purposes in such concepts. As part of transparent fire protection systems, it forms fire and smoke zones, safeguards escape routes and makes it possible to combine light incidence and fire safety in any number of situations where the only means of protection used to be massive and opaque doors, walls and roofs. As it is available in a wide range of types and possible combinations, fire-resistant glazing can provide additional features beyond fire protection, such as impact safety, sound insulation, solar control, thermal insulation and burglar resistance.